Age Scotland has managed a helpline for many years providing information and advice across a wide spectrum of topics. Last year we were lucky enough to be given funding by the Scottish Government to kick-start a Scotland wide, phone based community connecting service. The helpline often receives calls from older people feeling isolated or lonely and the community connecting service aims to tackle this head on. Callers can be referred to the service – which just involves them leaving a few details with an adviser. They are then contacted by one of the community connecting volunteers for a longer chat, to find about their interests, what sort of opportunity they might be looking for and any barriers that they might have to getting out and about (for example any mobility issues or difficulties accessing public transport). The volunteer can then get stuck into finding out what is available in the caller’s local area. We’ve been asked to help find all sorts of different opportunities from Men’s Sheds to IT classes, exercise to befriending. In many local authority areas there are specific community connecting projects delivered either by phone or face to face and where this is helpful for the person we will suggest they contact them for local expert knowledge. “As a volunteer, I have been involved with Age Scotland’s community connecting service since it started a few months ago and am thoroughly enjoying being part of it. The people I speak to have, for one reason or another, found themselves cut off from the community they live in and are unsure about how to make the first move to become more involved and less isolated. As I have been finding out, there is a lot going on out there. The difficulty for the people who contact us is knowing where to look and, at times, having the confidence to take that first step. That’s where we step in. After giving each client some pointers, or even passing on their details to a chosen group, we follow up by making regular calls every 2 or 3 weeks for a couple of months to see how things are progressing, or as one client said, ‘to keep me on track’. ‘He’s been absolutely lovely…and I’ve found it helpful talking to him’. This makes us even more keen to make sure that we can continue growing the service and helping even more people. To allow this to happen we’ll need even more volunteers – that’s where you might come in! If you think that you’d like to help people get back out and about in their community please get in touch with our team on 0333 32 32 400 or volunteering@agescotland.org.uk. You can also find out about all of the other ways you can get involved as a volunteer on the Age Scotland website. “I have been volunteering at Age Scotland since the beginning of October 2013. When I started I had just moved to the Edinburgh and didn’t know anyone/didn’t have a job. Volunteering at Age Scotland Morningside was one of the best things I decided to do! I have made great friends and love spending time helping in the shop. Now I have a fulltime job and continue to volunteer on the weekends.” Liza Gaiga. Find out more about volunteering opportunities with Age Scotland and the Silver Line Scotland. If you are interested in volunteer in your local Age Scotland shop, you can just drop by for a friendly chat. 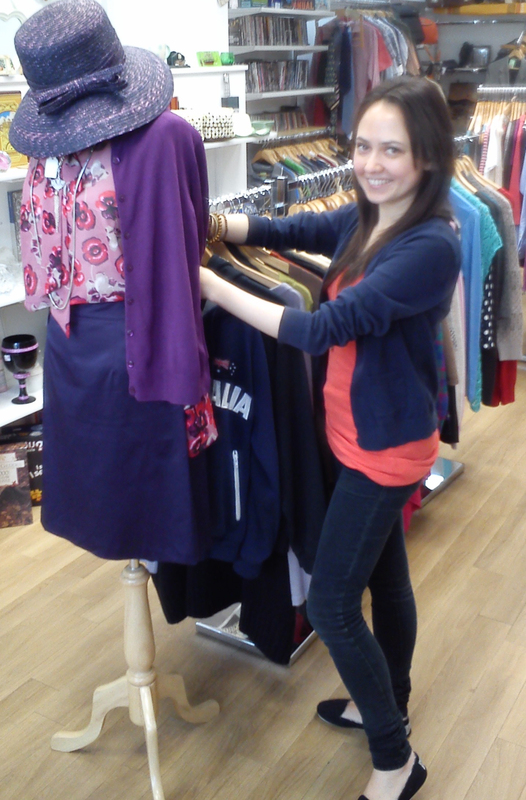 Annette has been volunteering at the Age Scotland charity shop in Stockbridge for six years. I began volunteering after my mum passed away I was very low and in need of a reason to get up every day, the shop gave me that reason. I really enjoy the company and the good fun atmosphere in the Stockbridge shop. We are a team and I feel part of it. I usually help sort and hang up stock and like to see the clothes selling and making money that way I know I’ve made a difference. Initially it took me 2 weeks to pluck up the courage to ask about volunteering and I’m so happy that I did its been a life changer. Find out more about volunteering opportunities with Age Scotland and the Silver Line Scotland. If you are interested in volunteer in your local Age Scotland shop, you can just drop by for a friendly chat. Find our Edinburgh shops, follow on Twitter or Like us on Facebook.